Sac City has a 28.42 acre Industrial Park located in the northwest corner of the city. 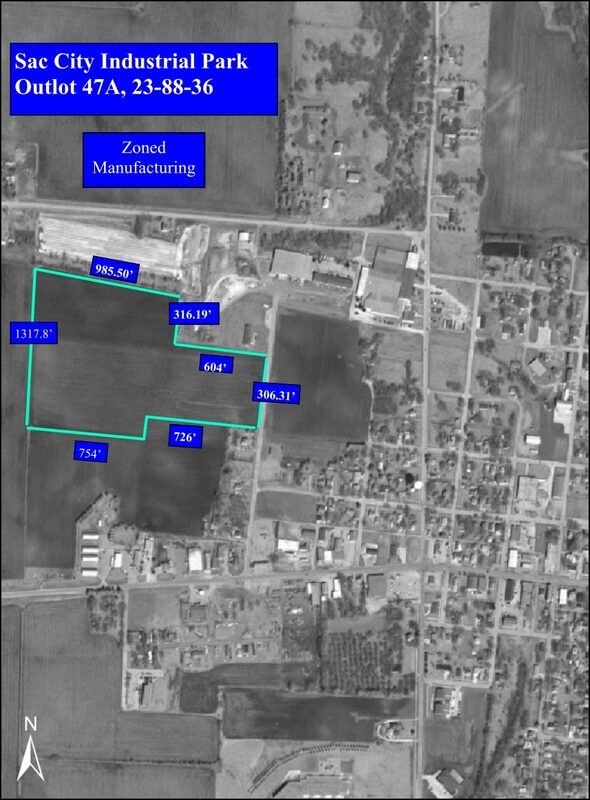 This property is zoned both heavy and light manufacturing. The park is directly linked to US Highway 20 by a 1/3 mile long, 29 foot wide, 8 inch thick concrete street, easily accessible to all truck traffic. There are utilities on site featuring a 12 inch water main with static pressure of 70 psi and natural gas with a 2 inch line at 50 psi. These utilities are municipally owned. In addition, MidAmerican Energy has available 3 phase electricity with 120/208, 120/240, 277/480 volts with additional voltage upon request. The Industrial Park is adaptable to any size lots required per prospect. Because the area is owned by the Sac City Municipal Gas Company, the cost per acre is negotiable and may be used as part of an industrial incentive package. USGS and topographical maps are available upon request. Soil boring tests have been completed which addressed subsurface conditions, water level observations, engineering analysis and foundation recommendations. In addition, a Phase I Environmental Assessment has been completed on the site, including an EPA Addendum. Use the links below to browse available sites and buildings in Sac County.